How to specify page range to split PDF file by using A-PDF Split? I want to specify page range to split PDF file. Is there any way for me to do it easily? With A-PDF Split, you are able to specify page range to split PDF file in minutes. Step 1: Launch the program and click the "Browse" button to select your PDF file. Step 2: Click the "All pages" tab or the "Part" tab to select range. Step 3: Click the "Split by every" tab as the split method or the "Split by bookmark" tab as the split method. Step 4: Click the "Browse" button to choose the output folder. You can choose the name pattern as well. Step 5: Click the "Split" button to split your chosen PDF file. 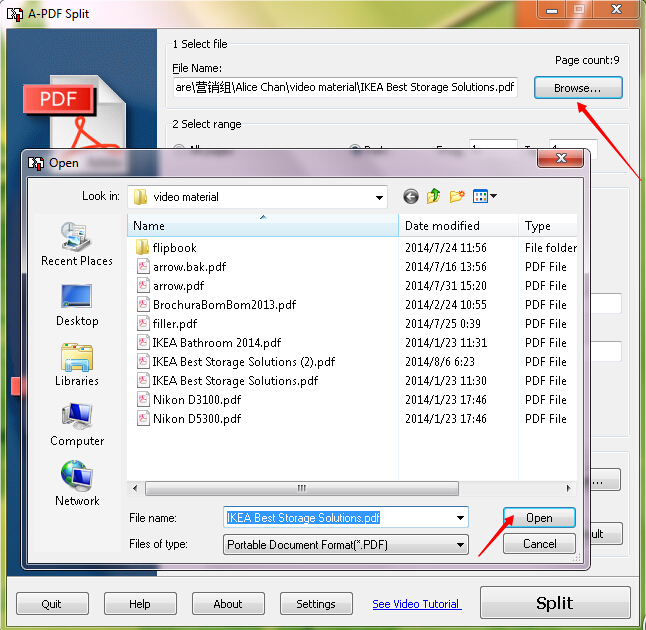 Step 6: Click the "Open output Folder" to view the split PDF file. Step 7: Click the "Exit" to end the process.